Neighbors hug Thursday in Mexico Beach. Their homes were heavily damaged by the storm. Those with the governor Thursday in his helicopter fly-over of Mexico Beach told Sunshine State News there were long, silent periods during his flight when he appeared too choked to talk. Scott flew over some of the towns and cities where category 4 Michael left buildings collapsed and splintered, hospitals damaged, roads and water systems compromised and more than a million homes and businesses without electricity. His flight Thursday included Bristol, Chipley, St. George Island, Mexico Beach, Panama City Beach and Panama City. Scott said he was "so grateful" for the search-and-rescue teams that rushed to reach the communities that were leveled, hoping to find survivors of the powerful storm. By afternoon, many areas still were cut off, but authorities were trying to deploy rescuers by helicopter and boat. Back in Tallahassee after the flight, Scott's office confirmed six deaths, but said from here on out a medical examiner would have to confirm any others. Scott said he expects the death count to climb. "I don't think they've gotten through everything," he said of search and rescue teams. The counties affected are a vast, staggered disaster zone, he said. "We have a lot of law enforcement coming in." Scott said 30 shelters are still open, occupied by about 4,381 people. More than 1,000 search-and-rescue workers have been deployed. Some 326,691 Florida customers were still without power at 8 p.m. Thursday. That includes about 60,000 in Tallahassee -- that's nearly 90 percent of the capital city's population. 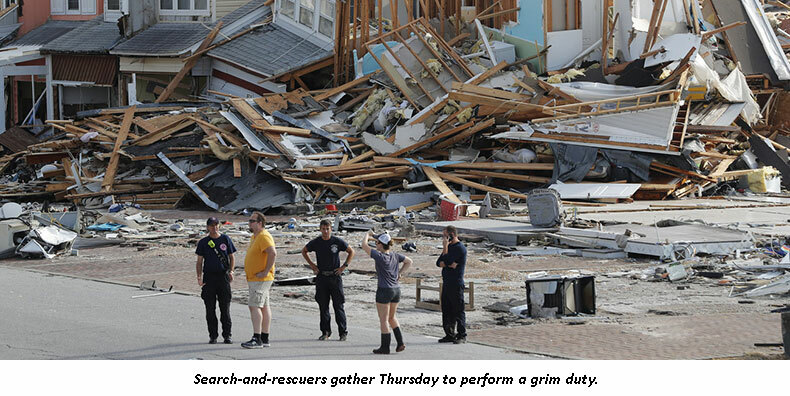 285 people in Mexico Beach defied a mandatory order to evacuate. Scott acknowledged that Mexico Beach, near where Michael made landfall, is the hardest hit, at least at first look. "There's just stuff everywhere." Mexico Beach is now a splintered, flattened wreck, with expensive boats pushed up halfway onto land, piers and docks destroyed, and the main street through town piled with the jumbled remains of permanent homes and vacation places. Scott also said cities like Chipley and Bristol look as if they were hit by a tornado. Emergency officials rushed to evacuate patients from storm-damaged hospitals. Five hospitals, five nursing homes and 15 assisted-living facilities had reported complete evacuations to the state by Thursday afternoon. Four more hospitals and five more nursing homes said they were planning evacuations, and one additional hospital evacuation was under way. One problem for officials was the difficulty of evacuation because some of the small, rural communities affected are among the poorest in the state. In many cases, residents lacked the means to evacuate. At 8 p.m. Thursday, Michael was about 5 miles northwest of Roanoke Rapids, N.C., heading northeast with sustained winds of up to 50 miles an hour. Finally only a tropical storm, it was moving relatively quickly, at 24 mph, and by publication time, should have speeded up, crossed Virginia and blown out to sea. Bay Medical Center Sacred Heart, a 300-bed hospital in the heart of Panama City was a huge mess Thursday morning. Michael had strafed the center, breaking windows, damaging roofs and stripping off the outsides of some buildings. Signage was strewn in the streets. Doctors, nurses and staff members wandered outside, some crying, some looking for cell service. Gulf Regional Medical Center, the other Panama City hospital, that was also damaged in the storm. Both were evacuating patients. On Thursday, Scott today also offered each utility in Florida the additional federal "push crews" to augment the ability of power restoration workers to reach communities. The idea is to allow them to restore power faster. Normally, power restoration workers remove downed trees and debris blocking their path when completing a power restoration mission. The push crews will go in in advance of utility crews and clear their paths so the utilities can focus solely on getting power restored. These crews are being provided through a partnership with the Federal Emergency Management Administration (FEMA) and the Florida State Emergency Response Team (SERT) and will be funded through Scott’s emergency order. Scott also requested assistance from Manny Miranda, Florida Power and Light’s senior vice president of power delivery, to advise and assist the state’s power restoration efforts. Miranda will travel to Tallahassee where he will serve as a liaison between the state and FEMA to help provide technical support and assistance. Most recently, Miranda worked to help restore power in Puerto Rico following Hurricane Maria. He will be stationed in the state Emergency Operations Center. Also, to help restore power faster, Florida SERT made first responder fueling depots available to utility crews across the Panhandle. This helps ensure utility restoration trucks have the fuel they need so they can restore power faster, the governor said. In 2016, following Hurricane Hermine, Scott set an expectation that each utility company in Florida have mutual aid agreements in place to save time during mass power outages. These agreements define roles and responsibilities during power outages so Floridians are better protected and power can be restored quickly. Before the governor did this, only about 60 percent of utility companies in Florida had agreements in place; now, prior to Hurricane Michael making landfall, more than 90 percent of utilities in Florida had existing mutual aid agreements. For information on power restoration and how many power restoration workers each utility company has in the field click here. Reach Nancy Smith at nsmith@sunshinestatenews.com or at 228-282-2423. Twitter: @NancyLBSmith. The majority of the photos on this page appear courtesy of CNN. I feel really bad for people in this economy, I like everyone have been struggling. But I tell you what I've done I've taken life into my own hands being responsible for myself. I knew trading was the answer for me and I've purchased different courses at different places and the best course I've found by far is at the website Emini S&P Trading Secret, just Google them and find them and do like I did they get started trading for yourself and take life into your own hands. I CAN TELL FLORIDIAN ONE THING, YOU HAD BETTER, IF YOU KNOW WHAT IS GOOD FOR FLORIDA, VOTE DeSANTIS IN, AND KEEP THE EFFORTS OF GOVERNOR RICK SCOTT CONTINUING. GILLUM IN REALITY DOES NOT GIVE A DAMN, NOR DOES HE CARE FOR FLORIDA, AND DOES NOT KNOW HIS *** FROM HIS MOUTH. ALL HE WANTS WITH HIS COMMUNISM, IS TO TAKE ALL OF YOUR HARD WORK AND EFFORT DESTROY IT, AND ALONG WITH HIS COMMUNISM, MAKE FLORIDA A GHETTO. AFTER ALL THAT IS WHAT YOU DESERVE TO GIVE HIM A CHANCE IS A GHETTO. WELL, I DON'T THINK SO, BUT IF HE IS ELECTED THOSE WHO VOTED HIM IN, DESERVE TO LIVE IN A SEWER, BECAUSE THAT IS WHAT FLORIDA WILL LOOK LIKE. The main effort after these disasters should be to relocate all the affected people and help them, financially and otherwise, to adjust to their new surroundings and situations. I'm not a fan of his politics, but I will give him huge accolades for his emergency response and preparation. Not many Gulf coast governments are as prepared for these hurricanes and their aftermath, as Florida is. I was in Tallahassee when it hit. Lots of tall trees and above ground electric grids. The army of tree trimming and electrical worker trucks on my out of town was tremendous. I feel for the families in Mexico Beach. The devastation was horrific. It looked like Hiroshima in 1945. Agree whole heartedly with 'Sportie'. Great leadership and organizational skills combine to make the overall response more focused and responsive. We are indeed fortunate to have someone of his caliber coordinate and oversee the various resources need in this terrible storm's aftermath. Bravo!! Scott is doing a good job.